Mac Pro Workstation, 4U rackmount with 3-bay Raid storage system. 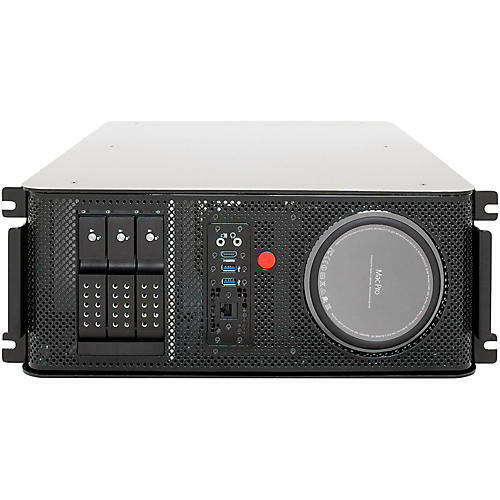 The LTNG-XQ-RMMP models use adjustable-depth rack mounting slides which securely support the product and once installed, allow a user to easily slide the unit out of the cabinet until the entire chassis is forward of the cabinet and remains fully supported. This allows for easier removal of the top cover (which is installed or removed with just two thumbscrews and takes 30 seconds) for servicing any interior components, making new connections to the installed MacPro, or removing/installing different PCIe cards in the Thundebolt-PCIe card section, which is available immediately after sliding off the top cover. The LTNG-XQ-RMMP does not include the disk drive bays or RAID controller and is a cost-saving version for those who don’t need the mass storage subsystem. The all-new-for-2016 LTNG-XQ-3-DTMP or RMMP models are identical but feature a 3-bay disk-ready RAID subsystem for 3.5” rotating disk drives (7200, 10K or 15K rpm) instead of the 8-bay 2.5” drive subsystem. This is ideal for those already having 3.5” drives they’d like to use, or those requiring up to 30TB (native capacity) storage in the same box as the MacPro and the other features provided.